Living as we do in an era of machine-produced goods, where every piece is identical to any other, we tend to forget how artists and artisans develop personal styles. Faced with turning out similar pieces because a design is selling well, artists typically develop favorite solutions to a design problem rather than reinventing the wheel with each new piece. 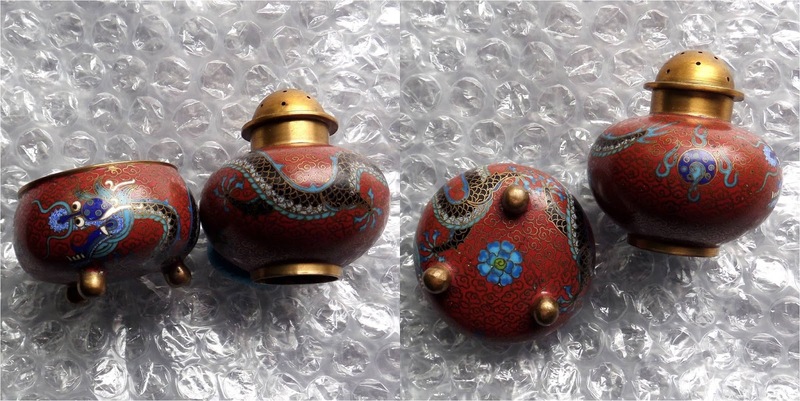 For example, in a prior post I discussed The Dot Artist – the cloisonné bead maker who liked to use small round circles evenly spaced around the circumference, possibly not only as an embellishment and a background feature needed to stabilize the enamel as it was melted in the kiln, but to assist in neatly applying the other parts of the composition. Remember, these little pictures are drawn with tiny strips of metal. Not surprisingly, skill develops from repetition. If you figure out a way to apply a nice floral branch design, and have to make a thousand such pieces, it only makes sense to re-use the design. 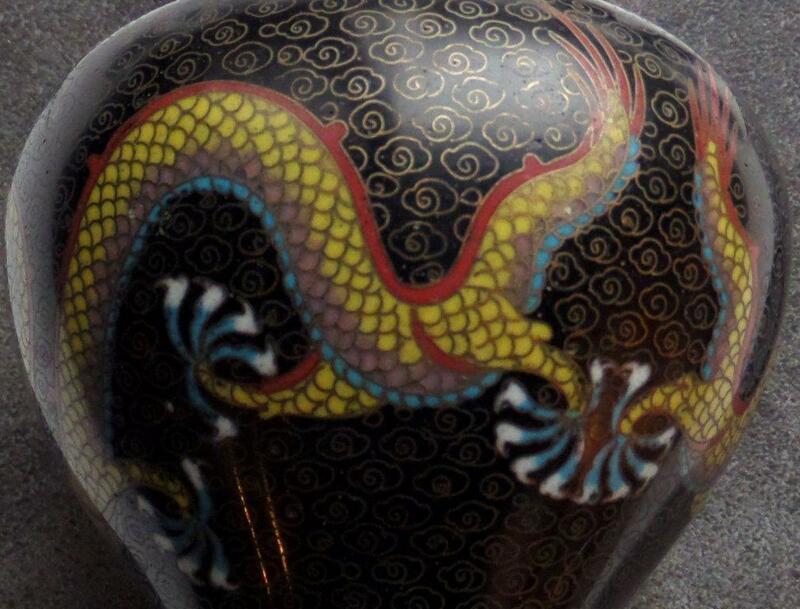 One of my first posts was about a style of dragon that persists throughout Chinese cloisonne from the turn of the 20th century until at least the 1980s. 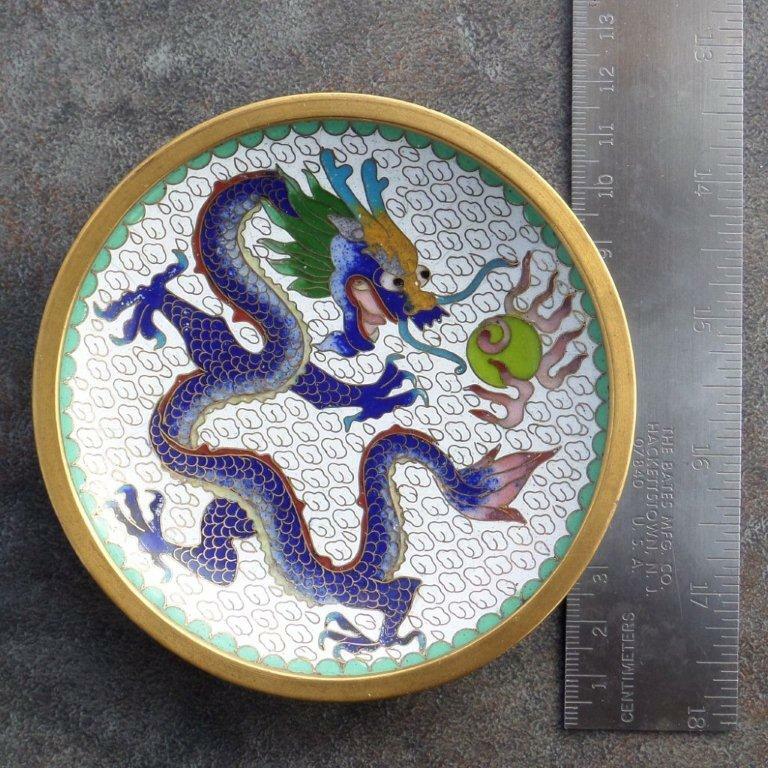 While investigating Chinese cloisonné beads that appear in costume jewelry from the 1930s, I noticed that a peculiar dragon appears over and over again, making me wonder if these beads were all made by the same person. It is characterized by having only 4 claws instead of the usual 5. Often the eyes are completely black, like a shrimp’s, rather than the more expressive black and white. The eyes and nose are formed from a single wire bent into two circles connected by a loop. The wire work is comparatively casual and the enamel colors very basic. A selection of pendants from an auction, and a Deco-era necklace with 3 similar pendants. Note the two openwork designs, one of which is a four-toed dragon. Why only 4 toes? A subtle protest against the Japanese invasions and occupation of the 1930s? No imperial dragons for you! Or, more likely, because 4 toes are just plain easier to fit into a small space? Or because, in a manner similar to the 4-fingered characters drawn by cartoon artists, 4 claws somehow looked better? Five claws do have a tendency to make the dragon’s paws resemble fans. One suspects that because these beads and other items were made for export and not for local use, the maker correctly surmised that foreign buyers would not be all that discerning. Then there’s the consideration that piecework done for low pay, under wartime workshop conditions, and for undiscriminating buyers is likely not conducive to precision workmanship. 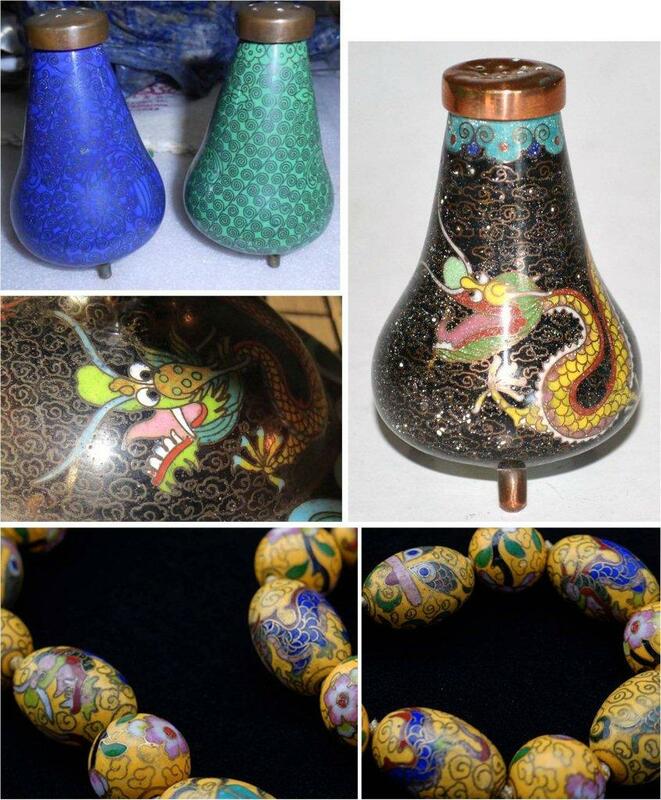 Other artisans have made dragon beads and small objects, some of quite tidy workmanship, others more casual. You can see the difference between these and the four-toed version (note such details as eyes, noses, background clouds). The earring bead and the larger finial bead next to it seem very similar in composition and enamel colors - did the artist feel that just a bit more room allowed for black-and-white eyes and 5 claws? Small bowl seems likely to be from c1920s, earring 1930s, lamp finial c1930, small bottles c1980-90s, gilded openwork bead 1990. 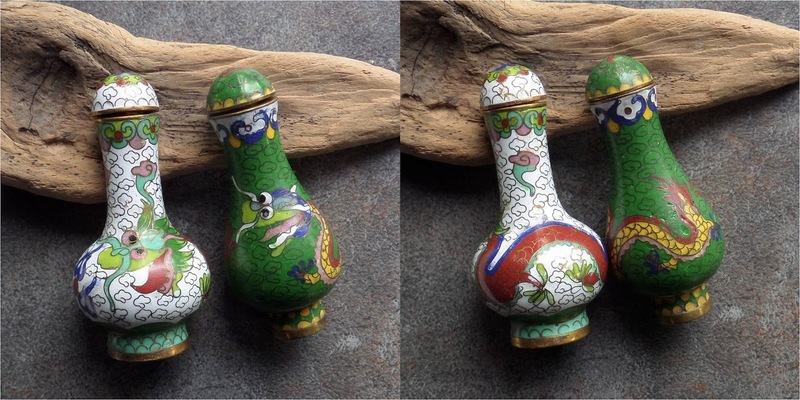 Small condiment set with 5-toed dragons with very fine detail. Lamp finials with 5-toed dragons. 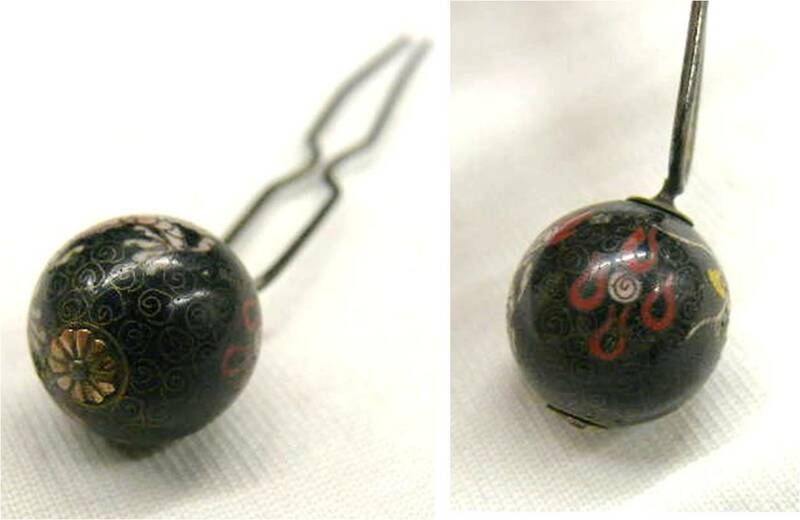 Japanese kanzashi (hairpin for a geisha coiffure) found by Magic Dragons Store. 5-toed dragon, old-fashioned "peaked" cloud spirals. 5-toed dragons. These dragons also have two horns (also seen in the little openwork pieces in the previous picture) instead of just one horn emerging from a bulbous base. Note the JingFa clouds as a background motif. 5-toed dragons. Four-toed dragons also appear on beads from c1990, albeit with a different style of “tailed” cloud, black-and-white eyes, 3 separate wires to form the eyes and nose (versus just a single wire bent into 3 loops in the four-toed dragons), thicker cloison wires, and gold electroplating. Four-toed dragons also appear on other c1990s items, so this seems likely to be yet another occurrence of the cartoonist’s 4-fingered hand. Purchased from Abeada around 1990. This necklace of huge beads (so 1980s!) 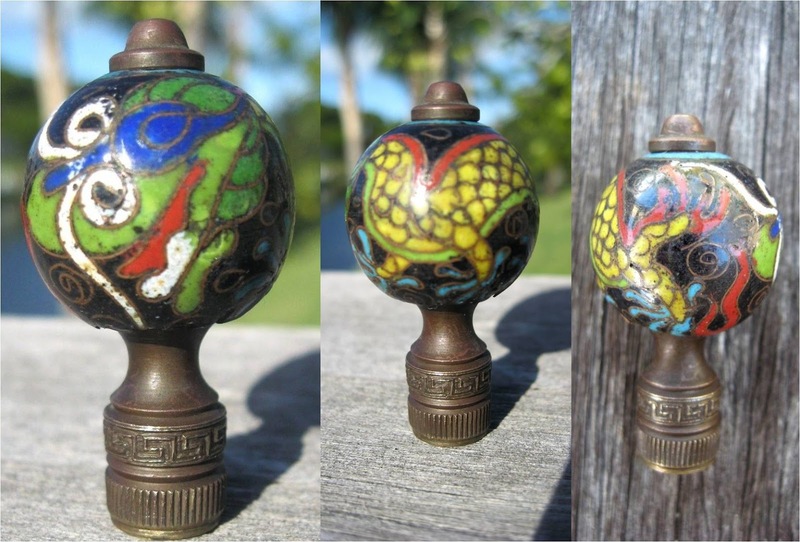 contains a large 5-toed dragon bead. Its size is likely the same as similar cloisonné beads in my collection that came from a broken necklace with black onyx beads (again, a very 1980s-90s type of stone bead). 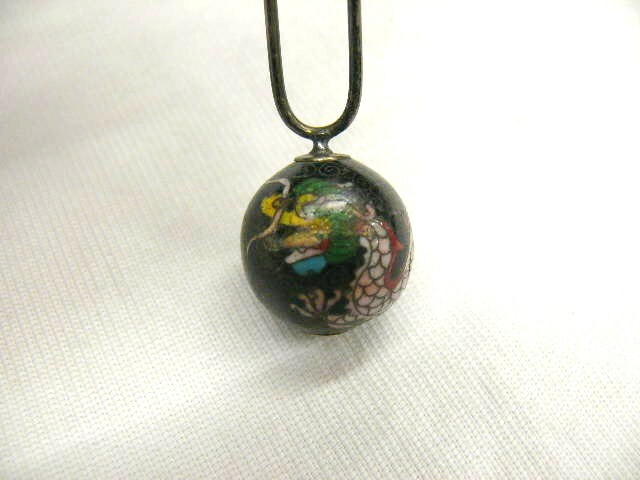 The clasp in my broken necklace is a product of the Kuo cloisonne factory in Taiwan, hence this necklace likely dates from the late-1970s - late-1980s. This illustration in the 1975 book by Arthur and Grace Chu (Oriental Cloisonné and Other Enamels) of course means that these beads were produced prior to 1975. But how many years prior? Note the 4-toed dragon on the napkin ring. 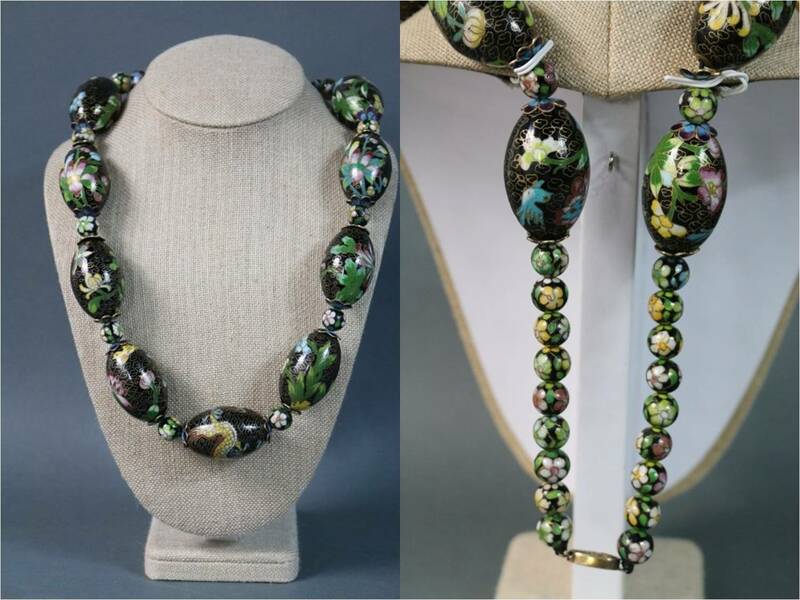 The green necklace likely dates from the 1930s, based upon the type of glass beads and findings. The dragon in the Chu photo is the black-eyed four-toed variety that clusters in pieces from the 1930s. Were the peach, phoenix, and bat beads also made then? The goldfish bead has a turquoise background and “peaked” clouds that look the same as those in the photograph beads. 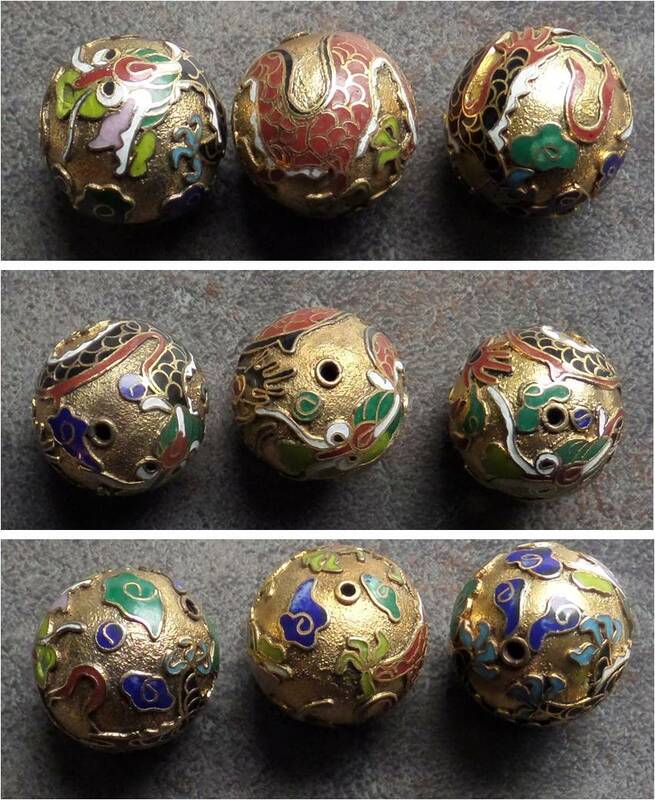 Were better beads such as these made for Chinese buyers during the 1930s, and the more rugged beads sold to foreigners? 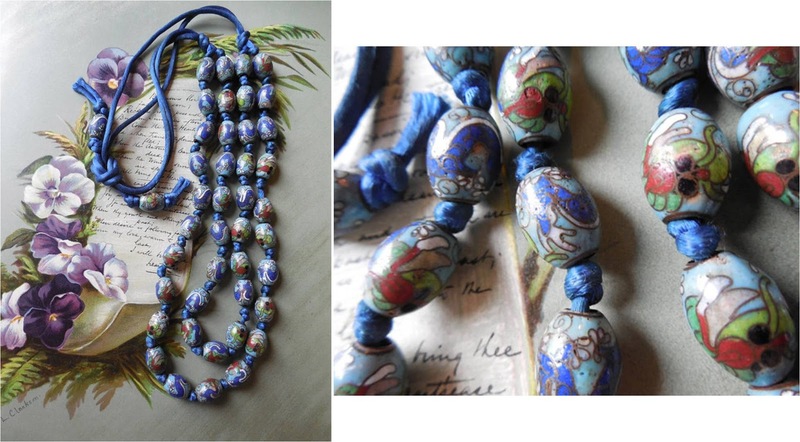 Or do these more skillfully made beads with their old-fashioned clouds date from the early 1970s? 1960s? 1950s? UPDATE: This dragon condiment shaker on offer from eBay vendor stephena17 seems a close match to a pair of shakers documented to be from 1939. The blue and turquoise shakers are documented to 1939. The dragon shaker with the same shape and feet presumably dates to the same era. 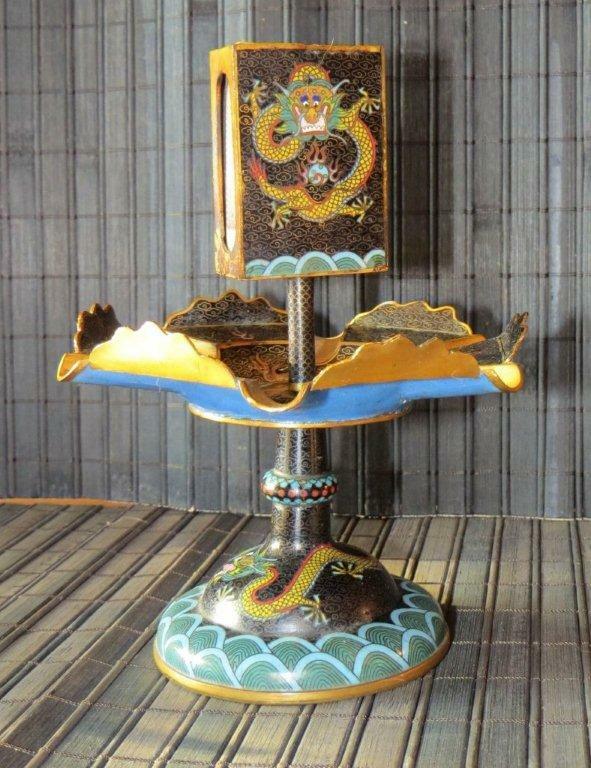 The other dragon decorates a small smoking set (photo below). You can see how details differ in the dragons - style of nose, horns, mane (especially under the chin), belly scales, bulbous horn base on forehead etc etc - although they present an overall similar appearance. 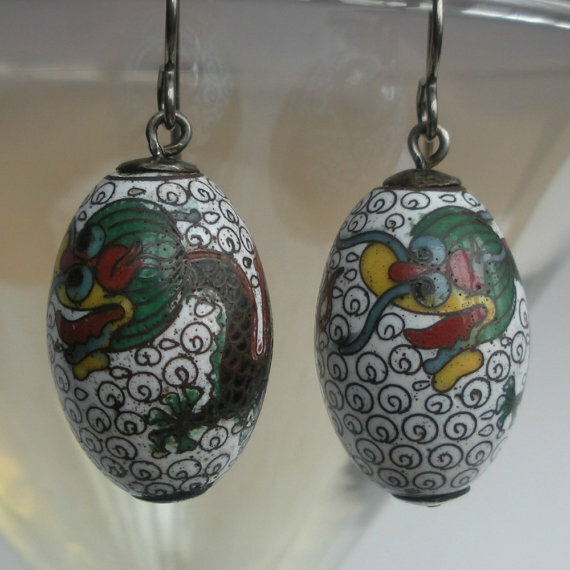 Hence the dragons on the yellow oval beads seem to be more old-school. An older craftsman who survived the 1930s and 40s, still working in the 1960s-70s? What's your guess? The size of the matchbox cover gives some indication of overall size.